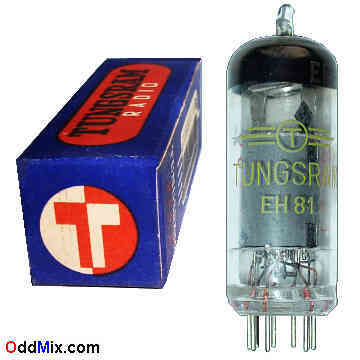 This is a rare, original, Tungsram EH81 Heptode electron tube. This tube was made for a very short time toward the end of the tube era. It is useable in television and radio, SW, FM receivers as limiter and for an audio pre-amplifier. It's five grids within it's glass container is certainly a rarity. An RF-AF hexode is useable for many circuits, oscillators and multiple input pre-amplifiers. Excellent for antique radio or TV [television] restoration projects, instruments or to set up a private vacuum tube museum. It is a NOS tube - New Old Stock, unused, excellent condition.